Two floodlight failures within eight minutes of play forced Motherwell’s league clash with Aberdeen to be abandoned tonight. A power cut to the floodlights above the main stand after five minutes forced a break in play, and as the other lights starting failing around the ground referee Alan Muir sent the players indoors. After a 15 minute delay, play was resumed much to the relief of the supporters, especially the travelling ‘Well fans, but that was cut short when the power dropped once more, forcing the officials to call an end to the night early. Speaking after the incident, Chief Operating Officer Alan Burrows insisted both clubs will do everything to help the travelling Motherwell supporters when the rescheduled fixture takes place. He said: “Floodlight failures are one of these things that happen in football, they’re so unfortunate but the people I feel most for are the 100 or so Motherwell fans who have made the trip here on a cold, Tuesday night in December. I thank them for their loyalty. He added: “We’ll look to work with the fans – I know Aberdeen have informed fans to keep their ticket stubs for coming back to the next game and in terms of transport we’ll look to see if we can help them in that situation as well, that’s only the right thing to do. Louis Moult was presented his Motorpoint Player of the Month award by Suzanne Clark and son Jack, aged 8, on Saturday. The two ‘Well fans were the lucky winners to present the star with his trophy in front of the crowd at Fir Park ahead of kick off against Kilmarnock on Saturday. And that chance could be yours next month once the voting closes for the award for the month of December. The Steelmen travel north to take on Aberdeen in the Ladbrokes Premiership tomorrow night. And for Mark McGhee, who will serve the final game of his two match ban, it presents an opportunity for his side to extend their unbeaten run following the goalless draw with Kilmarnock on Saturday. The Dons come in to the match on the back of an identical result with St Johnstone at the weekend, and will be keen to extend their unbeaten run to three matches. Despite some good opportunities throughout Motherwell’s clash with Killie, the Fir Parkers failed to find a breakthrough, and that is something that the manager hopes will improve tomorrow night. Speaking to the press this morning, he said: “I think we made enough chances to win the game and I was disappointed with a lot of aspects of it. On the back of the Dons 5-1 victory over Kilmarnock, McGhee admitted that tomorrow nights clash at Pittodrie will be a big task for his side. He said: “We know that we can go up there and lose 5-1 but we also know that on our right day we can go up there and give them problems. “I said after Kilmarnock’s loss to Aberdeen that we’ve been in the position where we’ve concede five in one game then come straight back and won the next game and that’s the nature of this league. For Motherwell, a win presents the opportunity to leap in to the top six, while Aberdeen can go to within a point of Rangers in second with victory at Pittodrie. The Steelmen have a few fitness doubts ahead of tomorrows clash with the Reds, including Chris Cadden, Stevie Hammell, Jack McMillan and Ross MacLean, who broke his toe on Saturday. Defender Richard Tait hopes to build on the weekend’s clean sheet as the Steelmen take on Aberdeen tomorrow night. But the summer signing knows that the trip to Pittodrie will be a challenging one. Speaking to the press this morning, the 27-year-old said: “It’s another tough one, none of the games are easy and tomorrow’s is just as hard as any other. The full back praised his teammates going forward and hopes they can get back to their clinical best in the away league clash tomorrow. He said: “We kept a clean sheet on Saturday and we need to try and build on that and get the same outcome as a back four. This season, Tait has been one of the consistent players in Mark McGhee’s side, playing every minute of every match so far. Aberdeen have chalked up one victory in their last three league outings and will be keen to return to winning ways in tomorrow nights clash at Pittodrie. For Derek McInnes, he will have a near full-strength squad to pick from as his side look to close the gap on second-placed Rangers. That side couldn’t find the breakthrough against St Johnstone at the weekend though, with the two sides playing out a 0-0 draw. Prior to that, McInnes’ men stormed to an emphatic 5-1 victory over Kilmarnock in what was the first of three matches in the space of seven days for the northern outfit. And while they come in to the match on the back of a goalless draw, the prospect of facing Aberdeen at Pittodrie is a challenging one for every club in the division this season. In the eight matches they’ve played at home so far, the Dons have lost just once and that was in the shape of a 1-0 defeat against league leaders Celtic, when Tom Rogic fired in the only goal of the game in the same weekend the Steelmen ran rampant at home to Ross County – winning 4-1. Goals haven’t been a problem for Aberdeen this season, and the league’s third highest scoring side have found goals from all over the park too. Midfielders Jonny Hayes and Niall McGinn sit level with striker Adam Rooney as the clubs top scorers on four goals, while Jayden Stockley and Kenny McLean have three to their names. Defenders Andy Considine, Shay Logan and Anthony O’Connor have all found the back of the net, while James Maddison has chipped in with some important performances and a particularly important goal – a last minute free-kick against Rangers to secure all three points. Equally impressive is the Dons defensive record. McInnes’ side have only conceded 15 goals in the league – a total only bettered by Celtic. This is the first clash between the two sides this campaign after the two sides met on four occasions last term. 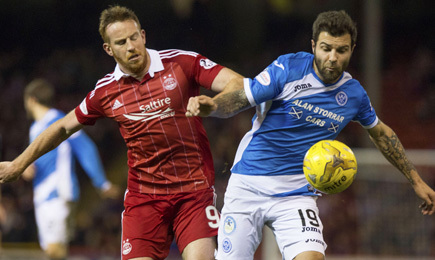 Aberdeen won twice, Motherwell once and the other match ended in a 1-1 draw. It’s an important match for both sides, postponed due to the Dons progression in the League Cup, where they got all the way to the final but lost 3-0 against Celtic. With the chance to move in to the top six, it is enough inspiration for Mark McGhee’s side and will be an intriguing encounter at Pittodrie. Referee for tomorrow’s away trip to Aberdeen in the Ladbrokes Premiership is Alan Muir. The 41-year old takes charge of his second Motherwell match of the 2016/17 season, after overseeing the 1-1 draw away to Ross County. A penalty from Louis Moult drew the Steelmen level following Liam Boyce’s opener. And that match was his first since October 2015 – when the Steelmen lost 1-0 to Celtic at Fir Park. In total, Muir has refereed 23 matches involving the ‘Well since his first back in the 08/09 season. When the Scotsman has been in charge, the ‘Well have won on 10 occasions, drawn five and lost eight. In those games, Motherwell have scored 27 and conceded 30. 82 players have gone into the book, 43 were wearing claret and amber, while nine players, five Fir Parkers, including former and current captains Stephen Craigan and Keith Lasley, have been dismissed. Muir will be ably assisted by Stephen Mitchell and Stuart Hodge; with John McKendrick on fourth official duties. The full back praised his team mates going forward and hopes they can get back to their clinical best in the away league clash tomorrow. ‘Well boss Mark McGhee insists his side have to be more clinical in front of goal when they travel up to face Aberdeen tomorrow night. After Saturday’s goalless meeting with Kilmarnock at Fir Park, the manager revealed his disappointment in a draw. But, speaking to the press this morning, McGhee made sure to highlight the positives he took from the weekend too. He said: “I think we made enough chances to win the game and I was disappointed with a lot of aspects of it. “But one of the things that happened on Saturday and one of the things that we have to reinforce is that we keep putting young players in. He added: “We’ve got to get these young boys experience by putting them in situations like Saturday where there’s a danger that they could lose you the game and you give them that responsibility and I think they learn from that. When asked about team news following a few injuries in recent weeks, the manager clarified that there may be a few stars still missing. Action from Fir Park as Motherwell and Kilmarnock play out a dull nil-nil draw in the Ladbrokes Premiership. ‘Well boss Mark McGhee felt his side did enough to win the match this afternoon and was disappointed with a goalless draw. Speaking to MFC TV at full time, the manager expressed his desire to see his team go on an unbeaten run after today’s result. He said: “I think that we could’ve won it in both halves so I’m disappointed not to have won. He added: “Not getting the goal can make you nervous that they’ll nick something even if it is against the run of play. With a number of draws across the division, McGhee hopes that his side can put in a positive showing against Aberdeen on Tuesday night. He said: “Somebody will hit a run, somebody will win a few games on the bounce and the way I see it is this is the start of a run – unbeaten today, hopefully now we can go to Aberdeen on Tuesday and stay unbeaten there. A number of youngsters have been getting game time under McGhee in recent weeks, and today was the same story. The boss said: “David Ferguson has been asked to play left back today when he’s a young right-sided centre-back or right back and he’s come in at this level and done well. “He’s not been playing too much so I was really pleased by and pleased for him. Ross MacLean was terrific and I was disappointed to see him go off injured and I hope he’ll be ok for Tuesday night. Images from today’s 0-0 draw with Kilmarnock in the Ladbrokes Premiership. Motherwell and Kilmarnock played out a tame, goalless draw at Fir Park this afternoon. And although the Steelmen created a few clear cut chances to win the game, both defences held strong for rare shutouts and a share of the points. Mark McGhee spent the first of his touch line bans in the stand joined by injured pair Stevie Hammell and Chris Cadden. That forced two changes from the side which started so strongly against Celtic. However, there was no dynamic start to this game and for most of the first half the action was contested around the middle of the park. The first routine save didn’t arrive until 17 minutes when Craig Samson comfortably held Rory McKenzie’s drive down the middle of the goal. ‘Well’s reply came from the impressive Ross MacLean, who worked a couple of neat one-twos before volleying the ball narrowly past the post from 12 yards. The Fir Park men had the bulk of the play as the half progressed and a couple of crosses caused some anxiety in the visitors defence. From Ben Heneghan’s knockdown Stephen McManus’ thumping drive from 10 yards was goal bound until it deflected off a defender’s hand. Referee Steven McLean, however, waved aside strong appeals for a penalty. As the game aimlessly drifted towards the half-time whistle, ‘Well created two terrific chances to open the scoring. Firstly, a clever flick from Louis Moult and an incisive pass from Scott McDonald sent MacLean through on goal but his drive across the ‘keeper was brilliantly blocked by Jamie MacDonald. Thirty seconds later Moult was again the provider when his disguised pass released Lionel Ainsworth but from six yards and with only MacDonald to beat he slashed his angled drive wildly past the post. Within three minutes of the restart Motherwell were forced into a change, when MacLean, who had seemed to have recovered from a hefty second minute challenge, limped off and replaced with Lee Lucas. In general the play from both teams was untidy but a wonderfully measured through ball from Craig Clay after 64 minutes sent Moult darting towards the Killie goal. Scott Boyd, though, tracked his run well to block the ‘Well striker’s shot at the edge of the box. With 15 minutes remaining, James McFadden called a double substitution hoping that the introduction of Dom Thomas and Jake Hastie might help break the stalemate. And five minutes later the home side produced the best move of the second half. Lucas released Richard Tait who hared down the right before cutting the ball back to McDonald. From the corner of the box his low curled effort carried the ball just beyond the far post as ‘Well’s hopes of taking three points slipped away. A game of few chances and ultimately they weren’t taken for the Steelmen. Match report and reaction to follow. Inches away!!! McDonald curls a low shot towards the far post but it is ever so narrowly wide. MATCH ATTAX | Young ‘Well fans can vote now for your Man of the Match. Tweet us your name, your age, your choice and #MatchAttaxMOTM. Lee Lucas is cautioned for a badly timed challenge. A fairly uneventful first half came to an end with two glorious chances for Motherwell. Second half to follow. Kilmarnock win the corner and McKenzie’s delivery is low, Tyson turns it towards goal at the near post but it’s wide. Great run and so close for MacLean! He bursts inside, plays a neat one-two but side foots wide from ten yards. Unlucky!